This is Wilma. 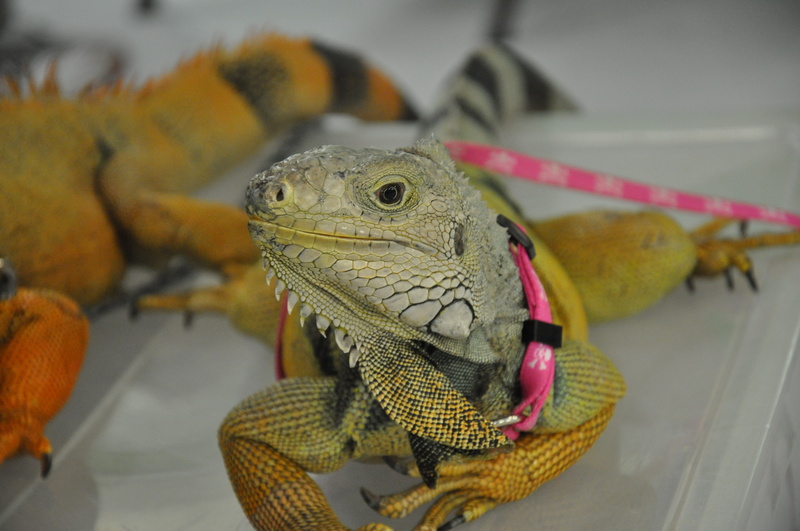 She is a green iguana also. Wilma shares my cage and cuddles with me at night. I’d like her to be my girlfriend, but at 20 years old she is just not interested in that anymore. I knew Wilma when I first got to the reptile rescue. After I got adopted by mom, I spent a year away from Wilma. Kim, the lady that runs the reptile rescue, is mommy’s best friend and she thought it would be nice if Wilma came to live with us. She is old and kind of cranky but I love her so much. Wilma recently had to have her tail cut off due to infection. When we do not shed properly, the build up of dead scales can kill the healthy scales underneath and can cause an infection. Luckily, Wilma’s tail will grow back in time. It doesn’t hurt her anymore so that makes me happy. Come back tomorrow and I will introduce you to more friends.